Mellissa of The Adventures of Wondermommy asked me to test her new Ice Cream Cone pattern about a month ago. Since I didn’t have a photo to work from, I was surprised to find that the cone is shaped like a waffle cone! 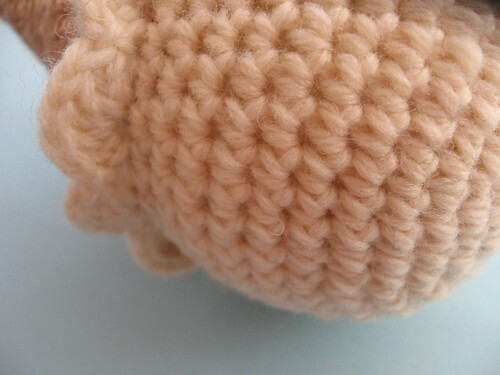 The overall pattern is really simple to piece together and you only need to know how to increase in the round and crochet shells. 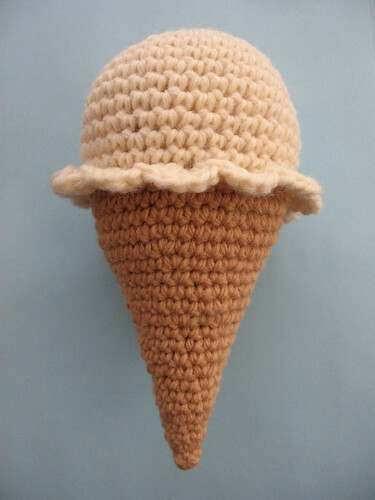 Both the cone and the ice cream start with the smallest number of single crochet stitches and increase to their widest part. Then the pieces are sewn together and the shell border is added. The whole thing works up relatively fast, especially since you can hide the ends with the stuffing! My Ice Cream Cone measures 3.5″ x 7″. I used some stash worsted weight wool that was a bit thinner than Red Heart Super Saver and a size E crochet hook. I’d like to try this pattern again in a lighter weight yarn. Also, I’m interested to see what the cone would look like with the wrong side showing. Visit the pattern page to see Mellissa’s sherbert version, which is so cute!